AT&T's dividend yield has moved away from the 7% mark. Nevertheless the stock is still trading at a very attractive multiple of 11x earnings with a yield of more than 6%. AT&T currently yields more than Verizon and Comcast combined. A DCF analysis also suggests the stock to be undervalued by 15%. With the recent appreciation in share price the dividend yield of AT&T (T) has once again retreated below 7%. Those who bought and locked in the 7% yield are happy about their decision. Meanwhile, those who hesitated might now be wondering whether the opportunity has passed. Even though 7% is obviously better than 6%, I still believe that this company has tremendous opportunity and for the reasons outlined in this report I argue that AT&T is still an attractive investment even if you missed the opportunity to lock in the 7% dividend yield. While bulls have been praising the outstanding yield of the company, bears have been pointing to the increasing debt burden the company is facing after more than doubling the debt within 5 years. In this report I would like to outline that even though the bears are correct in that such a major increase in debt is concerning, I believe that the company will be able to handle it. 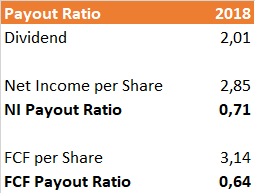 Additionally I think the dividend should be safe for the foreseeable future given that the payout ratio is at a healthy level both when compared to net income and free cash flow. For these reasons I argue that the company provides an attractive risk reward profile for income oriented investors. Not only is AT&T yielding more than its 5 year average of 5.39%, its yield of 6.24% is also significantly above the yields of Comcast (CMCSA) at 1.85% and Verizon (VZ) at 4.06%. AT&T 5 year average dividend yield is 5.39%. This means that at the current trading price you get almost an entire percentage point above this average in extra yield. Additionally the company’s competitors Verizon and Comcast yield considerably less. Verizon currently yields 4.06% which is a 2% point difference and Comcast yields 1.85% which is less than a third of AT&T’s yield. Between 2014 and 2018 AT&T more than doubled its total debt outstanding from $82 billion to a whopping $176 billion which is an increase of 115%. Naturally this rings alarm bells especially for income investors because they prefer high yielding stocks since they are looking to generate additional steady income. With this the emphasis is on “steady” meaning that a high yield might not be of much use if the company cannot sustain the dividend payments. The mountain of debt AT&T has build up in recent years now seems to threaten exactly that. However, after taking a closer look at the issue I discovered that the debt increase is actually not as bad as it is oftentimes portrayed. Although doubling the debt within 5 years is certainly troublesome, investors seem to have overlooked the fact that equity also increased during the same time. Due to this fact the debt to equity ratio has barely changed at all as shown in the table below. Maybe the high yield is caused by a high payout-ratio? Investors sometimes get excited by high yields only to discover that the sole reason for that yield is that the company pays out almost all of their available resources or worse yet, even borrows money to pay the dividend which is obviously quite the opposite of a sustainable dividend policy. Paying out the entirety of generated cash ensures that the company is unable to invest in growth projects to increase cashflows in the future. When compared to 2018 net income the payout ratio is 71%. The free cash flow payout ratio is even lower at 64%. This means that the company only pays out about two thirds of its available resources each year. 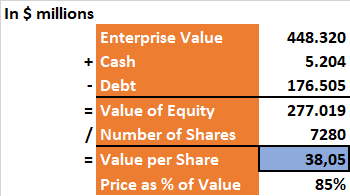 This way shareholders benefit from both a high dividend payment as well as future growth prospects because the company can reinvest the remaining third internally or use it to pay down debt which in turn enables future dividend increases because reduced debt means less interest expense. Additionally the dividend is somewhat protected against interest rate hikes and earnings slumps because those reductions first have to eat through that 30% buffer before they threaten the dividend. As previously shown the debt currently doesn’t threaten the dividend but I still think that the company should address the issue as soon as possible. The current interest expense is 30% of operating income. This isn’t necessarily a problem in of itself, however, AT&T should focus on paying down debt while interest rates remain low in order to be protected against possible rate increases in the future. Reducing the debt will free up more resources for both new projects and dividend payments and will make also create more security. AT&T currently trades at a trailing 12 month P/E of 11 which is only half of the S&P’s P/E of almost 22. It is also below Verizon at 15 and Comcast at 16. On top of that the results of a DCF analysis show that the stock is currently priced at 85% of its estimated fair value of $38 per share. This is company that is not only trading at half the P/E of the index but also cheaper than its competitors and trading at a discount to its fair value estimate. After adding up all the factors outlined in this article I conclude that AT&T is still a very good opportunity in the telecommunication space. I believe that the debt is manageable if the company focuses on paying it down while interest rates remain low. Additionally the level of the payout ratio allows the company to invest in new projects and also protects the dividend from earnings volatility because the remaining 30% that are not payed out can be reduced first without forcing them to cut the dividend. Furthermore the fact that AT&T trades at a P/E which is half of the S&P 500 makes it stand out as a rather cheap value play among mostly expensive alternatives. Together with the fact that peer companies trade at much higher multiples and therefore lower yields, coupled with the 15% undervaluation suggested by the DCF model, this looks to be a rare find which could prove to have quite a lot of potential. This is neither an offer nor a recommendation to buy or sell securities. I am not a financial advisor and this report is not to be considered financial advice. Please always conduct your own research and consult a financial advisor before making any investment decisions. Disclosure: I/we have no positions in any stocks mentioned, but may initiate a long position in T over the next 72 hours. I wrote this article myself, and it expresses my own opinions. I am not receiving compensation for it (other than from Seeking Alpha). I have no business relationship with any company whose stock is mentioned in this article.